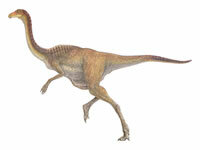 Gallimimus lived during the Late Cretaceous about 71 to 68 million years ago. It was up to 6 meters (20ft) in length, 2 meters (6.6ft) in height at the hips and 1000 pounds (454kg) in weight. 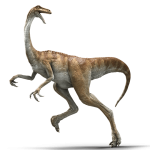 Gallimimus is a member of the Ornithomimidae family, which includes other ostrich-like dinosaurs. Gallimimus lived in what is today Mongolia and was found in the Nemegt Formation(Omnogov) Mongolia. Material includes but not limited to 3 nearly complete skeletons ranging from adults to juveniles. It lived during the early Maastrichtian. 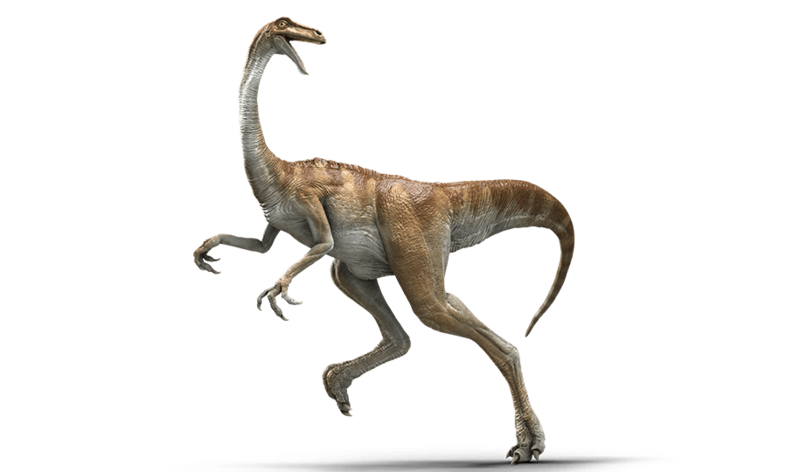 Gallimimus could be found on both Isla Nublar and Isla Sorna moving in herd behavior with very fast speeds. In the original Jurassic Park theme park on Isla Nublar, the flock of Gallimimus in the park were contained within the Gallimimus Paddock. As Alan Grant, Lex and Tim Murphy were trekking through the paddock on their way back to the Visitor’s center, they encountered a flock of stampeding Gallimimus that abruptly turned towards them in their flight. As the humans watched from the safety of a nearby log, the Tyrannosaurus broke from the cover of the treeline and quickly killed one of the Gallimimus, allowing the rest of the flock as well as the humans to escape as it stopped to feed. 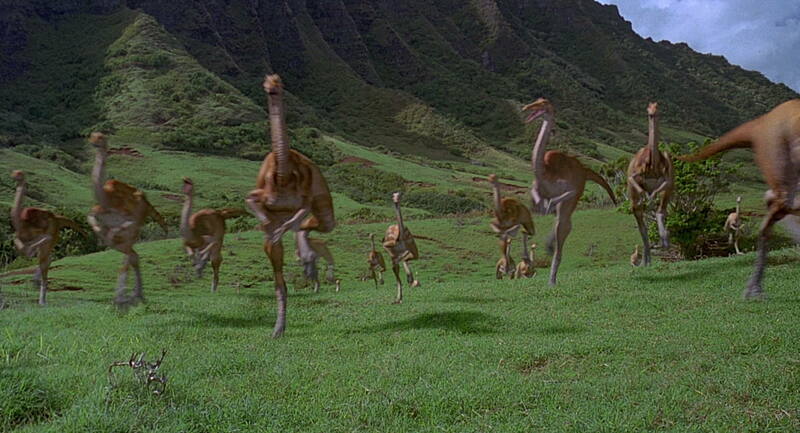 A flock of Gallimimus were seen on Isla Sorna alongside a herd of other dinosaurs that were attempting to escape the InGen Harvesters. At least two specimens were captured by the Harvesters and contained at their camp for eventual shipment to Jurassic Park San Diego. 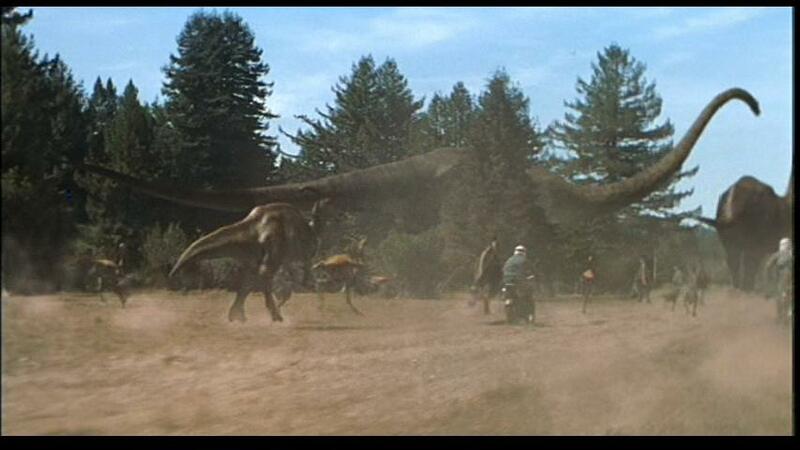 After Nick Van Owen and Sarah Harding freed the dinosaurs, the Gallimimus escaped, the hunters fleeing to avoid them. Gallimimus was one of the dinosaur species housed in the Jurassic World attraction on Isla Nublar. It was housed in an attraction named ‘Gallimimus Valley‘. Guests were able to view them through excursions on a modified Unimog that was able to freely drive through the containment area allowing guests to see the animals up close. The Jurassic World website lists the threat level of Gallimimus as ‘low’. In addition, the proportions of the animal are detailed as 26ft long, and 9ft high. Flock of Gallimimus attempting to escape the eruption of Mt. Sibo. 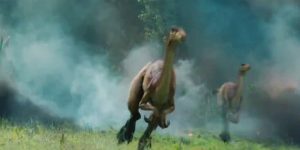 Several Gallimimus could be seen flocking past Owen Grady, Claire Dearing and Franklin Webb as they attempted to flee the destruction of Mt. Sibo. Several Gallimimus were captured by the team of poachers led by Ken Wheatley, and shipped off the Island and sent to the mainland. They were one of the species put up for auction at Lockwood Mansion, and were housed underneath the mansion in cages. As the dinosaurs were suffocating due to the gas leak in the basement, Claire Dearing freed the dinosaurs,including the Gallimimus from their cages. However, it was Maisie Lockwood, who made the decision to free the dinosaurs from the basement, allowing them to run free. As the Galllimimus escaped from captivity, at least one leaped on top of Eli Mill’s car before making its escape into the woods.